Hard to believe that September, the “Back to School” month, is coming round the corner. 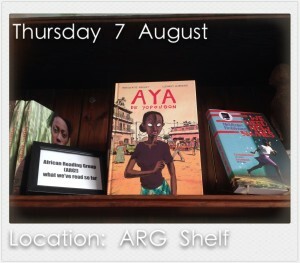 In anticipation of the African Reading Group (ARG) starting up again, Book and Kitchen is swatting up. 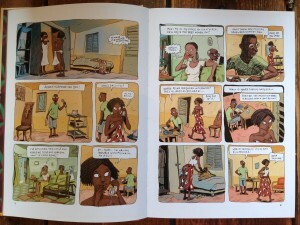 Hardly a strain as our reading material is the brilliant graphic novel Aya De Yopougon, written and illustrated by the wife/husband team of Marguerite Abouet and Clement Ourbrerie. of Yop red.We won’t give too much away but suffice to say there is a fair dose of drama, unrequited love and teenage rebellion. 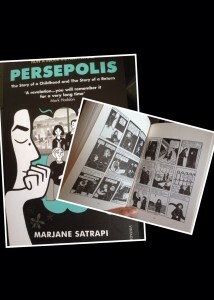 The similarities with another Book and Kitchen favourite Persepolis (by Marjane Satrapi) are hard to ignore. Both are coming of age stories set in the late 70s and early 80s. Both have an emphasis on gender roles and parental control. Both have also been translated into films (clip). But whereas Persepolis takes place in a world of stark black and white contrast, Aya is aflame with the heat, colour and bustle of the Ivory Coast. We’d forgotten how much fun it is to read a graphic novel. These two books with their evocative illustrations, gripping story lines and a generous dollop of humour are far from just being comics for adults. It’s been a pleasure to do our homework and for those of you who want to get involved come along to the ARG reading group event on Saturday 6 September (from 5:30 pm) to pick up a copy.